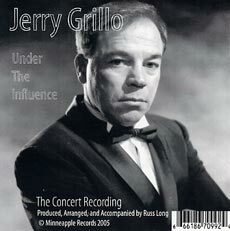 Jerry Grillo’s latest, Under The Influence, has the vocalist giving a twist to a lineup of songs usually associated with women singers, including the Doris Day favorite “Que Sera Sera” and Peggy Lee’s classic “Fever.” Many of the tunes come from Broadway and films. A throwback to another time, Grillo doesn’t just sing the songs. He performs them, bringing a dose of swagger and showmanship to the cabaret-influenced set. Grillo has a deep, sonorous voice that’s well suited to the rich material. His influences include Frank Sinatra and Bobby Darin, and he has worked in cabaret and musical theater. Grillo’s latest CD brings together all these different experiences. A native of Minnesota, Grillo is based in Wisconsin. He is accompanied by pianist and bassist Russ Long, who is also credited with the arrangements. Having only one musician behind him puts the focus squarely on Grillo. He and Long find the right mix on “Don’t Cry Out Loud,” a tune made famous by Melissa Manchester. Grillo delivers a straightforward, yet heartfelt, rendition of the song. With just Long’s piano to accompany him, Grillo strips the song down to its basic form. It turns out this is much better than the often overblown versions that other singers have recorded. In addition to a wistful “Que Sera Sera,” another highlight is “Do You Wanna Dance.” Grillo’s version follows in the style of Bette Midler’s fine, tender rendition. He, however, pairs the song with “I Could Have Dance All Night,” creating a nice new medley. Cabaret isn’t what it once was, but Grillo keeps the torch burning.